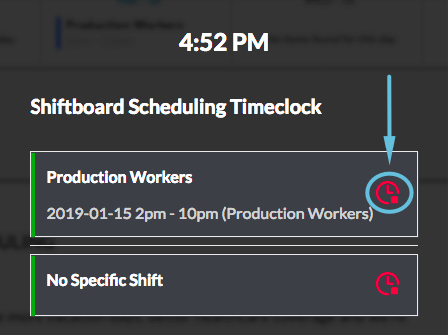 If your Shiftboard site has Clock In/Out enabled, then there are many ways that you can clock-in and clock-out of your shifts. This article explains how to use the web application for clocking in and out. You can also clock in using QR codes or with IVR using a PIN. 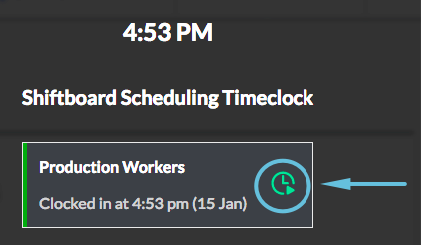 On the Timeclock page, click the clock-in icon for your shift. If you are not assigned to a specific shift, then clock in for No Specific Shift. Once you click the clock-in icon, you are clocked in. The icon turns green, and a message appears confirming that you have clocked-in. Click the X or Esc to close the window. Once you click the clock-out icon, you are clocked out. The icon turns red, and a message appears confirming that you have clocked-out. Click the X or Esc to close the window. 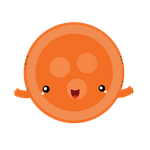 A timecard is a record of the hours that you worked, and once you have clocked in/out of your shift, a timecard is automatically created.